Time Taken : A leisurely 5 hours including lengthy lunch and pub breaks. This a cracking little family walk that is especially suitable for young kids. My lad first walked it aged 5. He is now 9 and took his friend with him today. It is mostly flat and easy going. 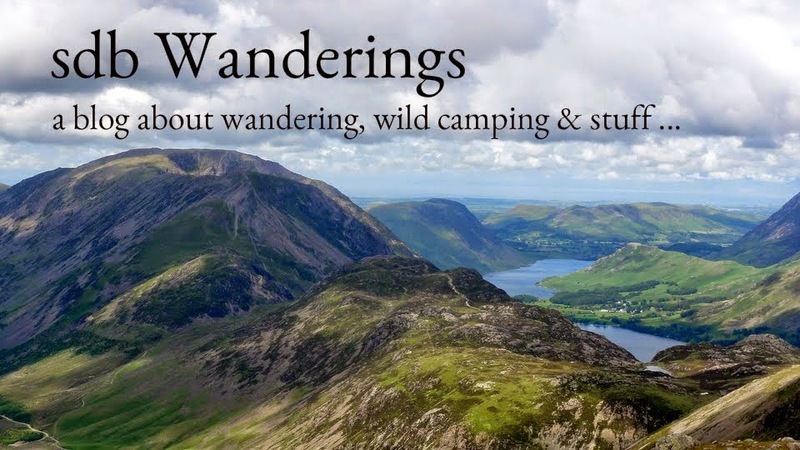 It has woods, waterfalls, great paddling spots, a tarn, a lake and a pub. It can easily be walked in 3 hours but it is really not a walk to rush. We had a picnic, 2 paddles and an ice cream (a beer for me and the Mrs) and it took 5 hours. The paths are clearly marked the whole way round and indeed follow the Cumbria way for some sections. The path then crosses a road and there is the option of taking a direct route up through woodland, or taking a slight detour to the right to see Colwith Force. We detoured. My photos of Colwith Force never seem to do it justice. It is an impressive waterfall though and well worth seeing. We stopped by Slater Bridge for a picnic lunch. The kids had a great time paddling in the Greenburn Beck and trying in vain to catch the tiny fish darting around their feet. We could have stayed there all day. The kids ended up stripping down to their undies and wading all the way in. Despite their best efforts though ...... the fish went uncaught. We followed the path to Elterwater with the promise of an ice cream providing adequate motivation for the kids. All good low level walks in the lake district have a pub along the way. 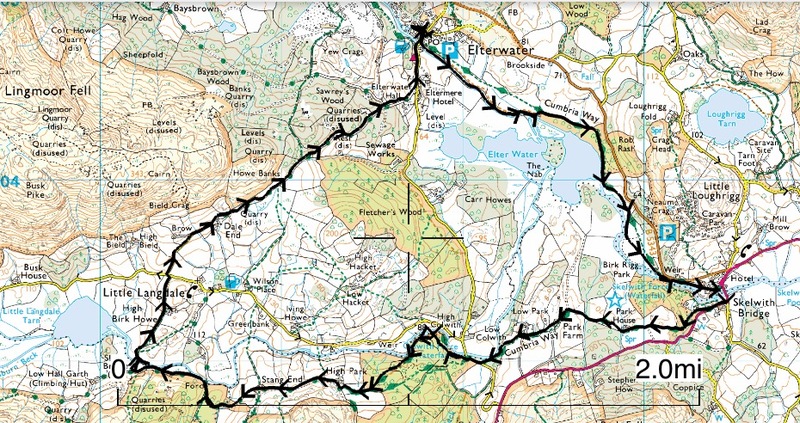 This walk is no exception and the Britannia Inn at Elterwater is a cracking place for refreshments. From here, the walk follows the Cumbria Way along the River Brathay back to Skelwith Bridge. The forecast was poor. Low cloud and some rain. I figured it might be a good day to tick off some of the smaller Wainwrights that had a chance of staying below the cloud base. This was a blessing in disguise as I was feeling particularly unfit after a 3 month absence from the fells. From the 'to-do' list, Black Fell and Holme Fell looked good for a nice low level circuit. The walk started well enough. A nice woodland path lined with bluebells and freshly unfurling bracken. There wasn't an obvious path up onto Black Fell so I just headed upwards along vague forestry tracks until one materialised near the summit. It's a nice little fell, well placed to peruse the surrounding area and offering particularly good views of Windermere. From here my intention was to make a beeline straight towards Holme Fell but that route looked a little dull. I consulted the map over a Coffee and a Tunnocks wafer and decided that I should probably extend the walk around Tarn Hows which would be far more picturesque. At this point the rain set in. The forecast predicted a few fleeting light showers and so I put my trust in the met office and stubbornly left the waterproofs and rucksack cover in the pack. The rain became heavier. I passed a few goretex clad people who glanced at me with knowing looks of superiority. The rain became torrential. Eventually I accepted defeat, took shelter under a tree and begrudgingly donned the shell jacket and fitted the rucksack cover. I set off with renewed purpose. The rain stopped. I stubbornly left the waterproofs on as I convinced myself that the clouds still looked threatening. The sun came out. I passed a few people in T-shirts who glanced at me with knowing looks of superiority. I started sweating. Eventually I accepted defeat and took off the waterproof garb. I continued on with a niggling feeling that there was probably a lesson to be learned here about using layers effectively but convinced that my many years of hill walking experience meant I was already an expert in such matters. I followed the waterfalls path down from Tarn Hows to Yew Tree Farm and then up onto Holme Fell. Wild Garlic - You can almost smell it! The slugs were out in force today. This one was the size of a small dog and delighted in worrying sheep. I also think it was after my lunch, until the threat of a ready salted crisp sent it packing. I've never seen 'fell cows' before. This one was blocking my path in a 'Gandalfesque' manner. It was looking like a stand off until I commented on her good looks, she bowed her head in modesty, and I slipped past. The path steepens near the summit, which turns out not to be the summit but a prominence called 'Ivy Crag'. The real summit winks suggestively from the other side of a little, but steep depression, which required a bit of scrambling to get to the top. Objectives achieved, it was now time to head back. I set off down towards a lovely little tarn which was labelled simply as 'Reservoirs (disused)' on the OS map. I guess this must have been a water source for the old Hodge Close slate quarry. Now it's simply one of many little un-named tarns in Lakeland. From here, a path winds it way through the old quarry to join the Cumbrian way back to Skelwith bridge. I really need to win the lottery. For the time being though, I really need to knuckle down and plan the next hike. 56 fells to go.